The nervous system of the thorax is a vital part of the nervous system as a whole, as it includes the spinal cord, peripheral nerves, and autonomic ganglia that communicate with and control many vital organs. Sensory information from the body and critical signals traveling to and from the limbs, trunk and vital organs all pass through this region on their way to and from the brain. Elements of both the central nervous system (CNS) and peripheral nervous system (PNS) are found in the thorax and play important roles in this region. The spinal cord represents the CNS in the thorax and serves as the vital link between the brain and the body. While it is only around one half of an inch (1 cm) in diameter, the spinal cord both carries nervous signals and processes many reflexes to support the structures of the body. The exterior of the spinal cord is made of white matter that quickly conducts information like a two-way road between the brain and the tissues of the body. Ascending tracts within the white matter carry sensory information to the brain, while descending tracts carry motor control signals to the muscles, glands, and organs. Within the white matter is a butterfly-shaped region of gray matter that acts as a relay station for nerve signals and produces reflexes to control muscle tension in the limbs. Extending from the spinal cord is a series of 31 pairs of spinal nerves that connect the tissues of the body to the spinal cord. Each spinal nerve pair exits the spinal cord between two adjacent vertebrae through the intervertebral foramen. Twelve of these nerve pairs, known as the thoracic spinal nerves, are found in the thorax. Each thoracic spinal nerve forms many smaller branches to carry information to and from the many muscles and sensory receptors spread throughout the thorax. Autonomic neurons are also carried by the spinal nerves and carry signals to autonomic ganglia and further on to the organs of the trunk. 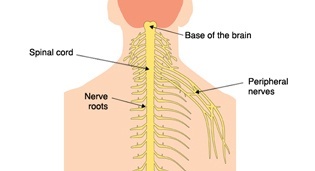 Branches of the T1 and T2 spinal nerves also form part of the brachial plexus that supplies nervous connections to the arms. Many autonomic nerves and ganglia pass through the thoracic region to innervate the internal organs. These autonomic components conduct the unconscious signals that control the organs and glands of the body. Sympathetic nerves and ganglia form the “fight or flight” system that deals with stress, excitement, emergencies and exercise by raising the heart and breathing rates, among other effects. The parasympathetic system, mostly represented in the thorax by the vagus nerve, acts as the body’s “rest and digest” system by counteracting the sympathetic system and relaxing the heart and lungs. Several nerves that originate outside of the thorax also play vital roles in the function of the thoracic region. The phrenic nerve originates in the cervical spinal nerves of the neck, but descends through the thorax to innervate the thoracic diaphragm. The efferent signals of the phrenic nerve cause the contractions of the diaphragm that permit breathing and keep the body alive. The vagus nerve is a cranial nerve that arises from the brain, passes through the neck, and innervates many vital organs in the thorax and abdomen. In the thorax it sends parasympathetic signals to slow the heart rate and to the lungs to reduce the respiratory rate. The effects of the vagus nerve on these organs help to prevent high blood pressure and hyperventilation.